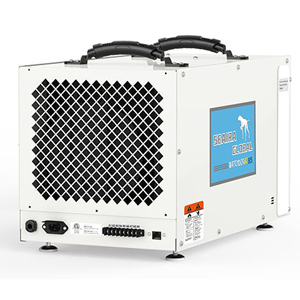 The WatchDog NXT85 is the second in a new series of crawlspace and basement dehumidifiers. With a capacity of 85 pints per day (80F/60%), and a Coefficient of Performance (COP) of 2.71 L/kWh, this unit can maintain up to 15,000 cubic feet. User-friendly features include a digital display, low-temperature operation, and auto defrost. The 85 is also compatible with optional upgrades, including remote control, duct collar kits, and Wi-Fi remote sensors.